Spotify Cops To Its Problems And Reveals The Massive Ambitions Of Its Founder : The Record Not exactly known for its transparency, the soon-to-be-public streaming giant offered an unprecedented look at its internal landscape this week. 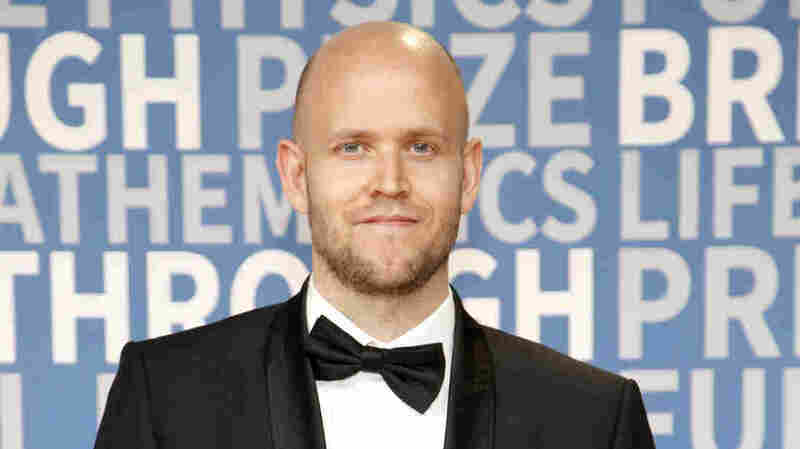 Daniel Ek, co-founder and CEO of Spotify. The company recently filed papers to begin trading on the public market. "Feels great to have the cat out of the bag. Transparency breeds trust," Spotify CEO Daniel Ek tweeted Wednesday, just after the Securities and Exchange Commission published his company's 256-page financial opus. The doorstopper document, called an F-1, is Spotify's manifesto ahead of going public, breaking down the 12-year-old streaming service's founders' hopes and dreams, its many problems and the minutiae of its accounting. It's the most complete picture of Spotify's internal landscape that we've yet seen, giving us a detailed glimpse into a company that has helped reshape our relationship to music in the digital world. Ek's tweet was probably a genuine sigh of relief. Any company that either pioneers or dominates a novel way to leverage tech is, necessarily perhaps, a black box of trade-secret special sauces — especially when its service is so widely used, and so frequently maligned, as his. On the road to getting 159 million people a month on its platform, 71 million of whom pay for it, the company had to court and cozy up to the recording industry, one that is so secretive and competitive that even the Voyager probes' historical collection of humanity's sounds were held back from commercial release for 40 years because of the copyright conflicts it involved. At the center of all this are the artists, who, with the advent of streaming, were greeted with a profoundly opaque system of distribution and remuneration for their creations. Artists such as Geoff Barrow of Portishead and Damon Krukowski have been vocal about the miniscule payments they've received within this new system. The Berklee College of Music, one of the country's finest, has an entire program devoted to examining the issue. Despite many artists having little visibility on their payments, we now have plenty on Spotify itself. The document filed Wednesday shows that Spotify is worth ... well, a lot. Maybe a whole lot or just a little-lot — it's not clear: The lowest recent estimate of its total share value puts it at $6.63 billion, the middle at $15.92 billion, the highest at $23.44 billion. That puts Ek's stake in his own company, of which he owns 23 percent, at $3.75 billion with the middle valuation of $90 per share. (Ek, who became a self-made millionaire and a Ferarri owner at 23, was probably always destined to join the billionaires' club.) The record labels — who, having negotiated stakes during the process of licensing their music to Spotify, are estimated to own a little less than 20 percent of the company collectively — will receive a big windfall. As ever, those with the most are well-positioned to make the most. As much as it's a useful look at the fundamentals of Spotify, the document is also a sort of narrative confessional, in which the founders acknowledge foibles and problems that reporters had been uncovering and teasing apart for years, but that the company itself had never quite admitted to. Laying its financial fate on the line, in the hopes the public will buy in, has finally pushed Spotify to be honest. In one note, the filing states, "the provisions of certain of our license agreements may require consent to implement improvements to, or otherwise change, our Ad-Supported Service." That sentence encapsulates a years-long battle over allowing people to listen to music on the platform for free, waged most publicly between Daniel Ek and Lucian Grainge, head of the world's largest record label, Universal Music Group. Grainge wanted to require people to pay for two reasons: the perception that free streaming diluted the value of music in the eyes of fans, and the fact that paid subscribers are where the money's at — 90 percent of Spotify's revenues come from them. But as a tech company, Spotify needed scale, not revenue — and free is the way to get it. Eventually, they reached a compromise; labels are now allowed to make music available only to paid subscribers if they choose. In a lengthy letter at the middle of the document, Ek makes a case for the benefit of Spotify for artists, saying that by the end of last year it had paid "more than $9.84 billion in royalties to artists, music labels, and publishers" since launching in 2006. That's much more than the $1 billion YouTube touted after more than a decade in business, but Ek definitely isn't listing the beneficiaries in the order of what they receive. "The music industry has a high level of concentration," the company points out earlier in the filing. "Universal Music Group, Sony Music Entertainment, Warner Music Group and [independent label coalition] Merlin, makes up the majority of music consumed ... approximately 87 percent of streams." The money artists receive is completely dependent on each individual label contract, but for the 87 percent of music streamed, and by extension the revenue generated on the service, the labels are the ones cashing those checks. Artists' contracts may entitle them to a portion of these revenues, but almost certainly not the majority of them. In a nutshell: "If, as a result of the repeal of 'open internet rules,' broadband providers in the United States decrease access to certain content, start entering into arrangements with specific content providers for faster or better access over their data networks, or otherwise unfairly discriminate against content providers like us, this could increase our cost of doing business and put us at a competitive disadvantage relative to larger competitors." For what it's worth, Spotify, an incumbent in the music streaming space, might actually benefit from the collapse of net neutrality for these very reasons. Its data partnerships with mobile service providers are a distant cousin to the "unfair" deals it describes here. Even Spotify can't get away from the world's most pervasive tech company. "We rely upon the Google Cloud Platform to operate certain aspects of our business and to store all of our data, and any disruption of or interference with our use of the Google Cloud Platform could have a material adverse effect on our business, operating results, and financial condition." "We have in the past been, and continue to be, impacted by attempts by third parties to artificially manipulate stream counts." A few of those attempts have played out in public. In 2014, the band Vulfpeck famously paid for an entire tour with money it made by encouraging its fans to stream a silent record, Sleepify, overnight. (Spotify eventually banned that clever little trick.) That was years ago — but just last month, Music Business Worldwide uncovered a plot that allegedly allowed a Bulgarian group to generate hundreds of thousands of dollars through a bot network programmed to stream records it had uploaded. Mike Errico, a songwriting professor at New York University, had a more philosophical idea: If Spotify pays artists after someone listens to 30 seconds or more of a song, what's the incentive to write songs any longer than that? His comments ended up inspiring some U.K. pranksters to test their own micro-songs on the service, with titles like "Ain't Nobody in This Business Makin' Money Anymore." "Publishers, songwriters, and other rights holders choosing not to be represented by collecting societies could adversely impact our ability to secure favorable licensing arrangements in connection with musical compositions that such rights holders own or control, including increasing the costs of licensing such musical compositions, or subjecting us to significant liability for copyright infringement." Adding to the pile, the small publishing company Wixen filed a $1.6 billion lawsuit against Spotify on Dec. 29, just two days before the Music Modernization Act would have made that suit illegal. "our dependence upon third-party licenses for sound recordings and musical compositions"
"ability to comply with the many complex license agreements to which we are a party"
"lack of control over the providers of our content and their effect on our access to music and other content"
"our ability to accurately estimate the amounts payable under our license agreements"
"the limitations on our operating flexibility due to the minimum guarantees required under certain of our license agreements"
"our ability to obtain accurate and comprehensive information about music compositions in order to obtain necessary licenses or perform obligations under our existing license agreements"
"assertions by third parties of infringement or other violations by us of their intellectual property rights"
"risk associated with our substantial indebtedness"
Spotify claims it "enabled an aspiring artist to reach a global audience," by virtue of Facebook co-founder Sean Parker adding Lorde's breakout hit "Royals" to his playlist, Hipster International. Parker may have been early to discover the brilliance of Lorde, but he was years after the first. The New Zealand native was signed to Universal at the age of 12, as Billboard reported back in 2013. The company also writes that "after eight months on Parker's playlist, Lorde ... was No. 1 on the Billboard Hot 100." The song was released in March 2013, and reached the top of the Hot 100 almost exactly seven months later. There's a better case to be made that the benefit "Royals" reaped from Spotify was worldwide availability, just as Chance the Rapper is now a Grammy winner thanks in part to SoundCloud. A lesser-known artist, Lauv, is also mentioned as having benefited from being featured on the platform: "We were able to help Lauv build his brand identity and personal profile." When NPR Music asked his representatives if that actually was the case, they responded that they are "big fans of Spotify, [who are] great partners." At the bottom of page seven: "We do not have a phone number." On page 92, a long letter from Daniel Ek arrives, to make the emotional case for investment in his business and to explain his vision for the company. "We're working to democratize the industry and connect all of us, across the world, in a shared culture that expands our horizons," he writes, in the platitude-heavy parlance favored by successful tech entrepreneurs. "People constantly tell me how music has helped them through life's biggest moments — birth and death, euphoria and heartbreak," Ek explains. The line calls to mind the company's playlists, which have lent a new specificity to music's usage. Last year, in fact, Spotify was accused of creating "fake artists" in order to augment some of its more popular "activity" playlists. "If discovery drives delight, and delight drives engagement, and engagement drives discovery, we believe Spotify wins and so do our users," he continues, in a phrase whose transitive circularity channels Billy Corgan ("Emptiness is loneliness, loneliness is ... "). More alarming for deep listeners and creators, though, is the ouroboros consumption — not appreciation and absorption — of music at the core here, an endless cycle necessary for Spotify's continued success. "Music has just been the beginning," Ek writes in his letter. "And we have even bigger aspirations. We envision a cultural platform where professional creators can break free of their medium's constraints and where everyone can enjoy an immersive artistic experience that enables us to empathize with each other and to feel part of a greater whole. But to realize this vision, professional creators must be able to earn a fair living doing what they love, where monetization is at the core of a creative proposition and not an afterthought." Let's take Ek at his word here and assume he truly, deeply would like to pay creators as much as humanly possible, enough to survive on their creativity, while at the same time continue to operate a globally dominant technology company. To do that, Ek and Spotify may need to remove other players from the equation — or as he puts it, "break free of their medium's constraints." Ek isn't talking about the constraints of human hearing or the constraints of creating beautiful and challenging sounds. He's talking about the constraints represented by an industry of fiefdoms. It sounds as though he'd like the job of king.